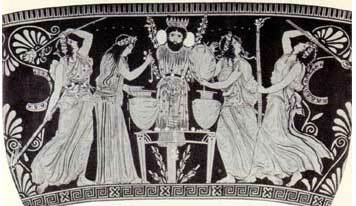 In contrast to his role in myth, the cultic Dionysos is largely a benevolent god of fertility, wine, and good cheer. His festivals took place in the autumn, winter, and early spring, the period from the harvesting of grapes to the opening of the new wine. The name of the festival means "carrying of the vine-branches." Two noble young men of the clan Salaminioi, dressed in women's clothes, carried grapevines with the grapes still on them, in a formal procession, accompanied by singing, to a special area called the Oschophorion at the shrine of Athena Skiras. There were songs and dances, which we are told were both cheerful and sad. The celebration took place on the seventh of the month Pyanopsion (~October, the "month of bean porridge", a dish prepared for Apollo), at the time the grapes were harvested and pressed to make wine. The seventh day was Apollo's day and apparently also the day when Dionysos took over the sanctuary at Delphi from Apollo for the winter months. Dionysos was said to be in terrible pain during the winter, when most living things sicken and die, or hibernate. This festival took place during the month Poseidon (~December, Poseidon's month), at various times in the various demes (villages) of Attica, the countryside around Athens. A feature of the celebration was a procession in which a large model of a phallos (a male organ) was carried along, accompanied by a noble lady serving as Basket-Bearer with a basket of raisins or other fruit. A Billy-goat was led along to be sacrificed to Dionysos. The Lenaia took place in Athens on the twelfth of Gamelion (~January, the "month of marriage"). Its name may mean "festival of the winepress" but more likely means "festival of the Maenads", another name for whom is lenai. The sanctuary where it was held, the Lenaion, has not been located. Dionysos was worshipped here in the form of a mask atop a wooden column bedecked with branches. Many vases show women ecstatically worshipping such an idol. Lit torches sometimes indicate a night-time ceremony. Some scholars interpret these vases as illustrations of the rites of the Lenaia, but there is no way of being certain about this. The scenes could be purely mythical. The Lenaion may have been the earliest shrine of Dionysos at Athens, and the earliest tragedies and comedies may have been performed here, before the Theatre of Dionysos was built. The City Dionysia became the main festival for the performance of drama, but tragedies and comedies were also put on during the Lenaia. One of these was Aristophanes' Acharnians. Only Athenians could be present for these performances; no one from another city could attend. At Delphi, a group of Maenads called Thyiades ("raving women") roamed Mount Parnassos in a midwinter celebration of Dionysos. As late as the first century CE they got stuck in a blizzard and had to be rescued. Every second year, the Delphic women were joined by women from Athens. The Lenaia may have been the "home" festival for these Athenian women. The Anthesteria ("festival of flowers") also called the Older Dionysia was celebrated on the 11th, 12th, and 13th of Anthesterion (~February, "month of flowers") on the full moon preceding the City Dionysia. This festival celebrated the second pruning of the vines and completion of the second fermentation of the wine which was now ready to drink. Before the City Dionysia was established, this was the last of the winter celebrations of Dionysos at Athens. On this occasion rituals centred on the sanctuary of Dionysos in the Marshes, whose location within the city has not been discovered. This was the time when new wine was ready and the storage-jars were first broached. It was also a time when the ghosts of the dead could roam the earth, a time to celebrate children as they turned three years old, and a time to re-enact the sacred marriage of Dionysos to the Queen of Athens. Anthesteria was celebrated at the Limnaion, the Shrine of Dionysos in the Marshes, whose location in Athens is not known. All other temples of the gods were closed during Anthesteria. The first day of Anthesteria featured a procession in which Dionysos was brought into Athens in a model of a ship mounted on a cart. The god may have been represented by a celebrant wearing a mask. There may also have been ritual abuse and obscenities shouted by celebrants riding in wagons. Little else is known about this day. The first of the wine was offered to Dionysos and presumably quite a bit of it was drunk. On this day everyone, including children, had their own pitcher or jug from which they could pour wine to drink. Special markets were set up to sell these vessels. 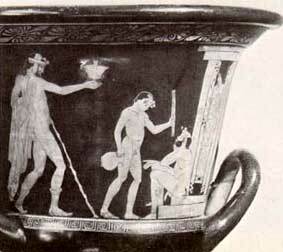 A standard chous (the singular of choes) held nearly three quarts, but some of the jugs were smaller, and in any case the Greeks normally diluted their wine with several parts of water. Children who had turned three were crowned with flowers and given their own little jugs. (Some of these have been found in the graves of children who died before they could take part in Anthesteria.) This was also a time to give toys and pets to children. Schoolteachers were paid their annual fee on this day (added gifts were welcome), and in return they hosted receptions for their pupils. The main event of Choes was the official drinking contest, with the priest of Dionysos as host in a building in the Agora. At the sound of a trumpet the drinking began. All the invited guests were required to remain silent while they drank. 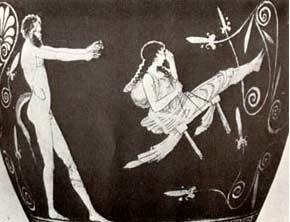 This strange custom was explained by the myth that Agamemnon's son Orestes came to Athens to seek purification after killing his mother Klaitaimnestra to avenge her killing of Agamemnon. Since Orestes was ritually unclean, he could not be given ordinary hospitality, but he could not be rejected either. So he was invited to the drinking contest, but the usual good fellowship was forbidden. When the contest was over, the winner got a full wineskin as a prize! There were also drinking contests in private homes, with a cake as a prize. In a departure from regular practice, everyone brought his own food and wine; only wreaths, perfumes, and dessert were provided by the host.. 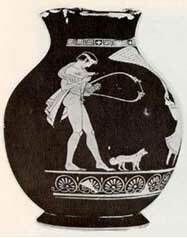 Afterward the guests carried their garlands, draped around their pitchers, to the shrine of Dionysos in the Marshes and dedicated them to the god. It was probably on this day--actually on the evening of the day preceding, since for the Greeks the new day began at sunset--that the sacred marriage or hieros gamos was celebrated. Dionysos was formally wedded to the Basilinna, wife of the Archon Basileus (King Archon) i.e. the King surrendered the Queen to Dionysos. The bride was escorted from the sanctuary of Dionysos in the Marshes to a building called the Boukoleion ("ox-herd building") in or near the Agora. Before the ceremony fourteen noble women called Gerarai ("ladies of honour") made offerings at fourteen altars in the sanctuary. The ceremony was strictly secret. 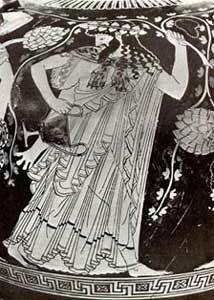 The wedding, evidently an ancient fertility rite, was explained by the myth that in earlier times the Athenian hero Theseus had to surrender his bride, the Cretan princess Ariadne, to Dionysos. 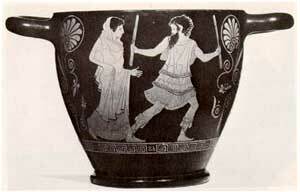 The groom may have been the priest of Dionysos or the Archon Basileus, dressed and masked as Dionysos. 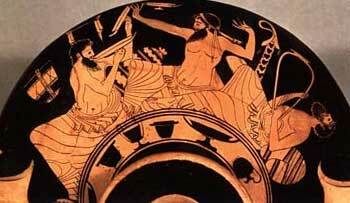 Compare the marriage of Dionysos at Athens to his mythical reception at Thebes! On the next day, the actual day of Chytroi, vegetables were boiled and offered to Hermes as Guide of Souls to the underworld. No living person partook of the feast. Another event on this day was Aiora ("Swinging"). Masks were hung on trees, and children swung in swings. This was apparently a rite of purification. The Athenians explained it with the myth that Ikarios, of the Attic village of Ikaria, was given the vine by Dionysos. When he gave the villagers wine, they thought they had been poisoned and killed Ikarios. His daughter Erigone hanged himself from the tree under which her father lay. Athens was then struck by a plague. The Delphic oracle prescribed the annual rite of Aiora as recompense. Altogether, the last day of Anthesteria was considered a day of ill omen. The spirits of the dead were thought to be roaming the earth. People smeared their doorways with pitch to keep them out, and they chewed a plant called buckthorn to ward off their effects. At the end of the day, and of the festival, the head of each household gave a ritual shout: "Spirits begone, Anthesteria is over." The City Dionysia was held on the 9th to 13th of Elaphebolion (~March, the "month of deerkilling"). The festival lasted for five days and ended on the full moon (13th Elaphebolion) following the Spring Equinox (that is the full moon preceding Easter - a feast day incidentally named after the Germanic godess Eastre or Oestara). The festival honoured Dionysos Eleuthereus, who had come to Athens from the border village of Eleutherai, on the road to Thebes. 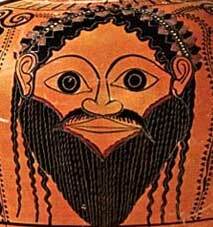 As at the Lenaia, Dionysos took the form of a column topped by a mask. The festival is best known as the main occasion on which tragedies and comedies (along with dithyrambs, choral songs honouring Dionysos) were performed in the Theatre of Dionysos. It was probably established in the late sixth century BCE to be the urban equivalent of the Rural Dionysia and the greatest and last of the annual Dionysiac rites. Since the weather now made sailing possible, delegations from cities allied to Athens attended the City Dionysia, in contrast to the other festivals of Dionysos. The festival began with a torchlight procession in which the statue of Dionysos Eleuthereus, which had been escorted from its shrine near the Theatre to the Akademeia outside the city walls, was brought back. The Ephebes, young men in military training, played a prominent role. There were also many phalloi (models of male organs), some sent by cities established as Athenian colonies. This was an occasion for both the citizens and others living in Athens to assert their civic identity. Metics (resident non-citizens) wore special scarlet robes and carried trays of offerings. Citizens dressed as they pleased and carried wineskins on their shoulders. People carried special loaves of bread (long and thin, called obeliai). A young lady of noble birth was selected to be Basket-Bearer. The Choregoi, who took on the public obligation to pay for the tragic, comic, and dithyrambic performances, paraded in splendid robes, sometimes embroidered with gold. The procession stopped at the shrines of various gods, where dances were performed. Then came the main sacrifice at an altar near the Theatre. Clearly this was a grander and more formal version of the procession which had taken place during the winter at the Rural Dionysia in the various villages of Attica. The final event of this day was a komos or revel (cf. komodia, "comedy"), hardly unique to this festival. In the evening, bands of revellers roamed the city with torches, auloi (reed instruments), harps--and wine. The Theatre itself was purified by sacrificing a suckling pig (a frequent rite of purification). Libations were poured by the ten generals (strategoi) whom the Athenians elected annually. While the Athenian Empire survived, the tax or tribute sent by the subject cities was carried through the orchestra of the Theatre and presented to the audience. The orphaned sons of soldiers killed in war, who had been maintained at public expense until they reached military age, were paraded in the orchestra dressed in the full armor which they had been given. A herald proclaimed their fathers' distinction. Also on this occasion, golden crowns could be awarded to civic benefactors. And masters could have their slaves proclaimed free by a herald before the audience. Although individual seats were not assigned, the arrangement of the spectators (about 17,000 all told) probably reflected the role they played in the city: the male citizens arranged by tribes in 10 of the 13 wedges into which the Theatre was divided; women and resident foreigners at the sides; priests of the gods and recipients of special honours in the front rows. The plays were an integral and essential part of the festival, and the festival was no less a part of the plays. Spectators arrived in the morning for a day of drama; they brought wine and snacks to sustain themselves; and celebration of Dionysos was very much a part of everything. 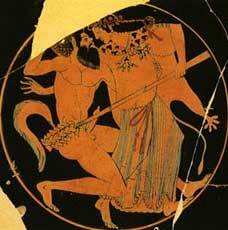 These rites of autumn, winter, and spring show how Athens, in its annual calendar of festivals, worshipped Dionysos. They included the vintage-celebration of Oschophoria; the festive fertility-processions of the Rural Dionysia; the apparently ecstatic Maenadism of the Lenaia, Anthesteria with its concern for new wine, young children and the spirits of the dead, and its sacred marriage of Dionysos; and finally the City Dionysia, established after the others as a culminating civic event. In cult, Dionysos was first and foremost a god of wine and fertility, but he took on a greater importance for the people of Athens. Acknowledgement: Hardy Hansen of Brooklyn College & other sources.